Saturday, June 26, 2010 Narconon California contributed in getting the word out in their Communities. 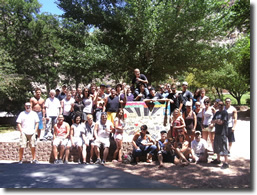 Narconon’s residential rehab center in Nevada honored the UN Day against Drugs by hosting a Picnic for their community at Kershaw-Ryan State Park in Northeastern Nevada. In addition to enjoying the free swimming, food and activities the crowd of approximately 75 people received Drug Facts Booklets. Attendees signed a colorful Pledge to Live Drug Free! 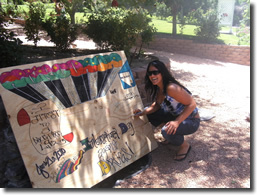 In the beautiful high desert of San Diego County students of Narconon Sunshine Summit Lodge volunteered their day to help prepare food commodities for the needy in their community and set up a Drug Education Resource Station at the Community Center. They too signed a pledge to live drug free lives. In Los Angeles, Drug Education Presenter, Mr. Roger Davis participated at the annual Watts Men’s Health Fair. In addition to delivering Drug Education Presentations to the men who attended the lively event, Roger gave out hundreds of Drug Facts Booklets to attendees. The Event offered free health screenings for diabetes, blood pressure, cholesterol, vision, dental, & HIV and STD testing. Narconon California recognizes the importance of observing the annual United Nations Day helping children and youths make the decision to never use drugs!